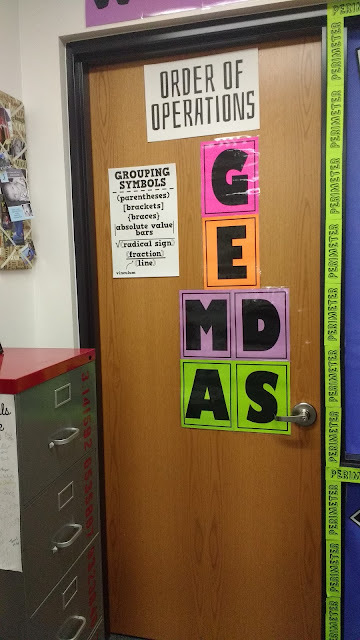 This year, I'm really emphasizing order of operations at the beginning of the year in Algebra 1. Last year, I tried to jump right into evaluating expressions because my kids have been learning about the order of operations since 3rd grade or so. I figured review would be pointless. I was WRONG. My students may have been looking at order of operations problems for years, but these problems most likely didn't contain grouping symbols such as absolute value bars, radicals, or fraction lines. 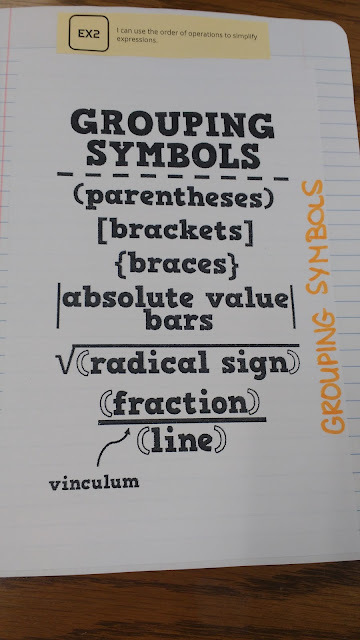 My students need practice with this broader definition of grouping symbols than just the parentheses that they learned about from Please Excuse My Dear Aunt Sally. I really liked the Grouping Symbols poster I created last year, so I decided to turn it into a notebook page. 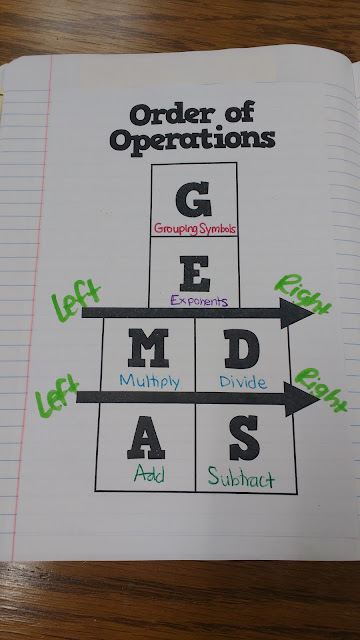 I gave students a blank order of operations template, and we filled in the meaning of each of the letters. 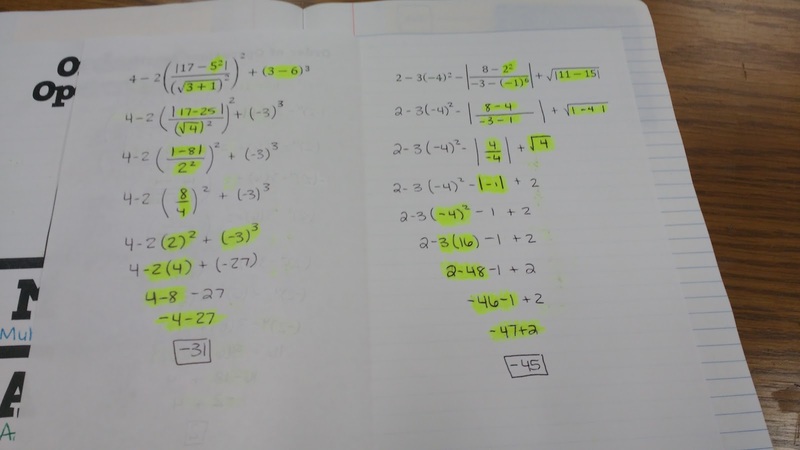 I made a big deal of emphasizing that multiplying and dividing are really the same operation so we do them from left to right. 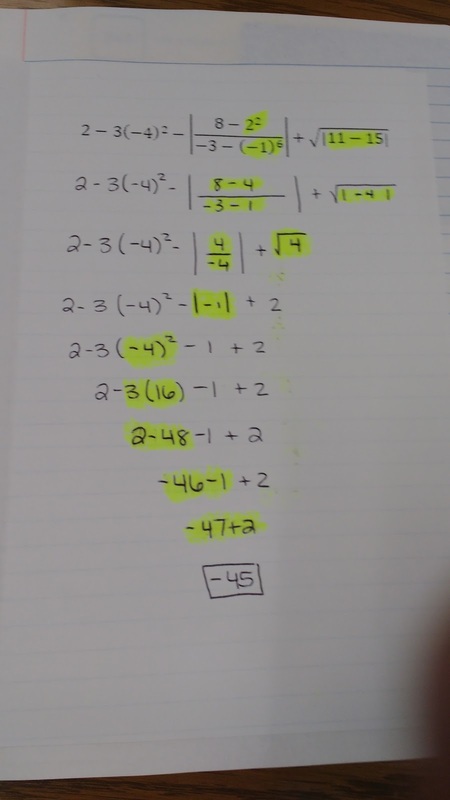 Same with addition and subtraction. Next, we spent some quality time looking at negatives and exponents. I had a silly moment when I was making this notes page, and I used 3 for all of my exponents which led to some very boring results. Oops! Changing the 3s to 4s worked much better. I think in the future, I would make this activity into some sort of card sort instead. 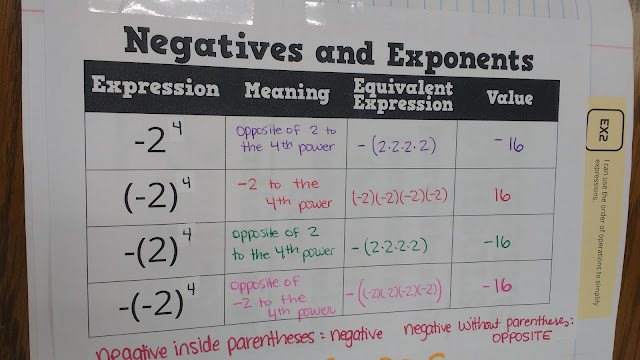 I also wish I would have had a place where students formally recorded the difference between a negative inside parentheses and a negative without parentheses. I did a better job of this with some of my classes than others. 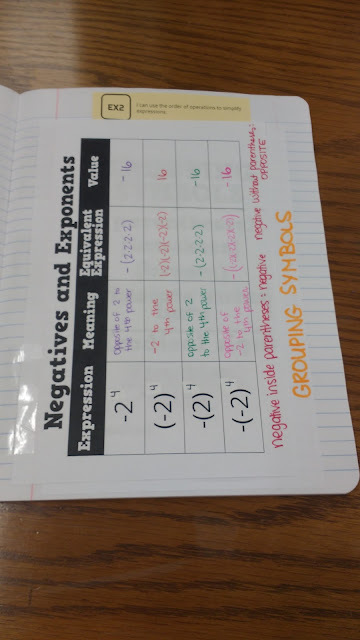 When I was gluing in my notebook pages, I accidentally forgot to leave a page for this set of "Negatives and Exponents" notes. Oops... So, I ended up taping it in as a flap over the grouping symbols. You can see that better below. That's why the grouping symbols bit that sticks out says "Grouping Symbols." 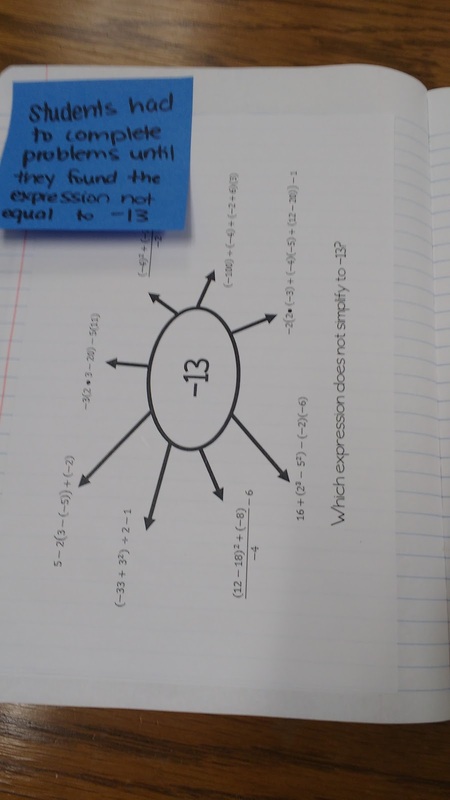 Next, I gave my students a booklet foldable that had three order of operations practice problems. These were definitely complex problems. I wrote them to involve negatives with exponents, absolute value bars, radicals, and fractions. The last thing we glued in our notes for order of operations was an activity I borrowed from Greta Bergman. 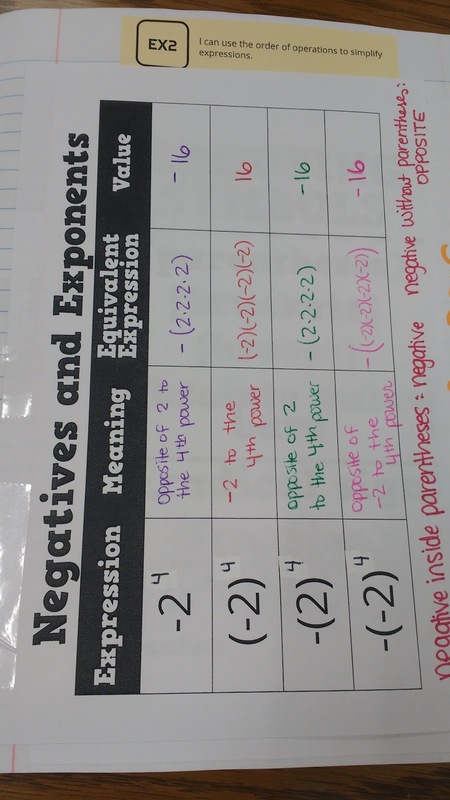 Students are given 8 expressions. 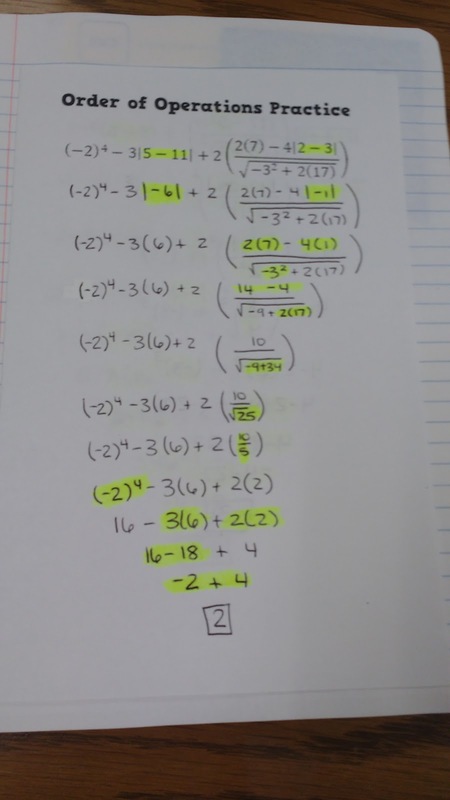 7 of the expressions simplify to -13. 1 of them doesn't. I challenge students to complete problems until they find the one that doesn't equal -13. I tell them that when they find that one, they may stop. Of course, they have to get their work checked by me. 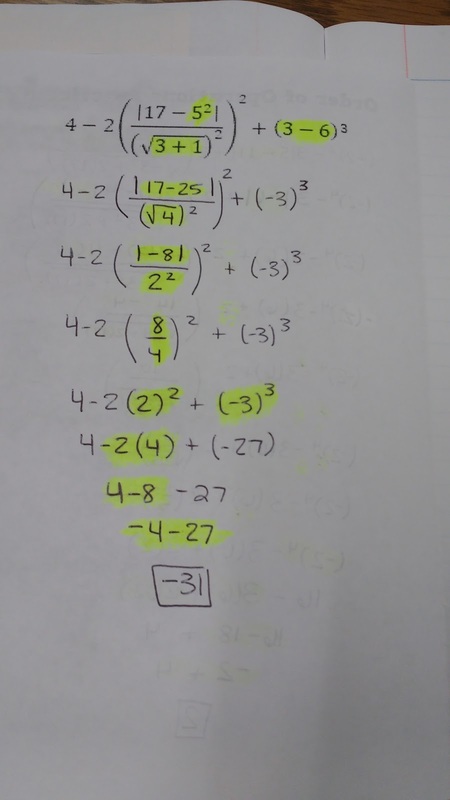 Students are always eager to get their work checked when they get an answer that isn't -13. Usually, I find some error in their work, point it out to them, and send them back to re-work the problem. So, they end up getting LOTS of practice! Files for these notebook pages can be downloaded here. Perfect timing! Love the order of ops notebook pages. Thanks for sharing - I'll definitely be using these!